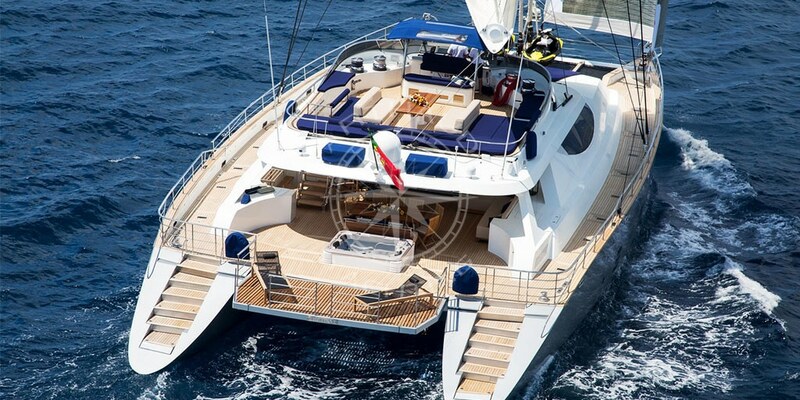 Exceptional boats, catamarans are excellent for their stability, performance and large living spaces. Are you planning a boat trip (catamaran, sailboat, yacht) for your next holiday? Many nautical activities can be carried out during the day or in the evening on-board catamaran boats around Antibes and Juan-les-Pins. If you want to find a more original activity than jet-skiing, why not rent a catamaran in Antibes in order to sail along the French Riviera in mild weather? The catamaran is an ideal multihull boat for offshore stays. Alone or with several people, this ship offers exceptional opportunities for excursions by allowing its passengers to approach the coast in a perfectly autonomous way. 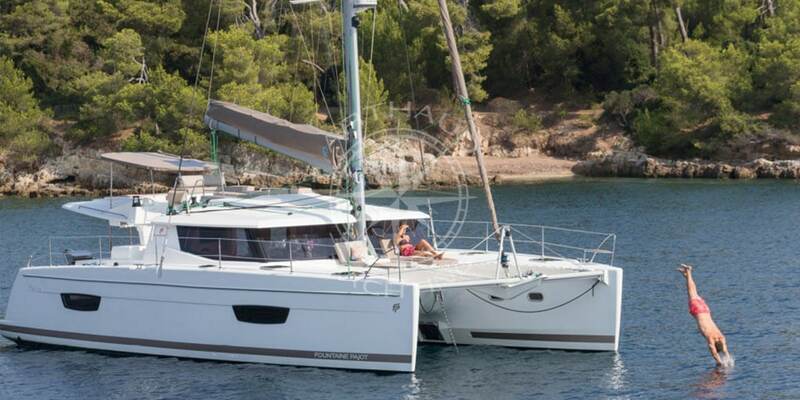 For a romantic moment or a trip to Antibes with your collaborators, the catamaran is the best solution. The rental of a catamaran boat from the port of Antibes is ideal for a sea trip in Provence-Alpes-Côte d’Azur. If the cities of Nice, Cannes, Juan-les-Pins, Sainte-Marguerite and Hyères are charming places to stroll with family or friends, water sports remain the main attraction of the region. The clear Mediterranean water has everything to please, and attracts several thousands of visitors every year. A rental boat such as a catamaran will allow you to leave from Vauban harbour and visit the coast in your watercraft. You will be able to sail towards the Lérins Islands, along Golfe-Juan, and finally go to Saint-Honorat Island, which is only accessible by boat. Please note that it is also possible with Arthaud Yachting to rent yachts in Antibes and in all the ports of the French Riviera. The rental of a catamaran boat will allow you to carry out original nautical activities of which you will keep excellent memories. 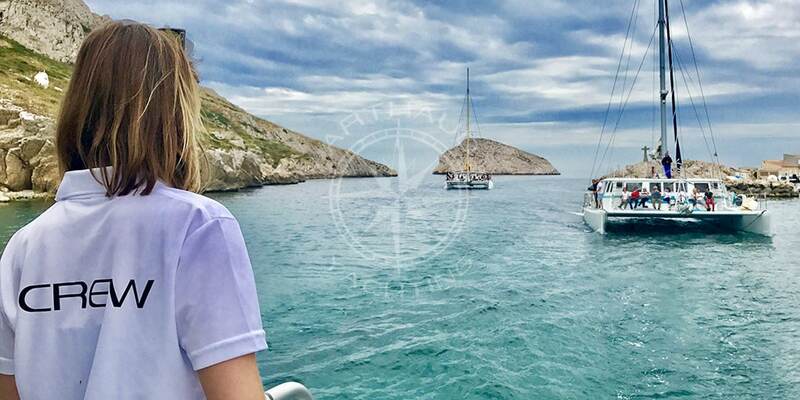 This last one, available on reservation, will allow you to carry out a unique nautical activity around the Alpes-Maritimes and near Cannes at the best price. If you like to stroll by the sea, stand up paddle or swim, a catamaran trip along the French coast should not displease you. 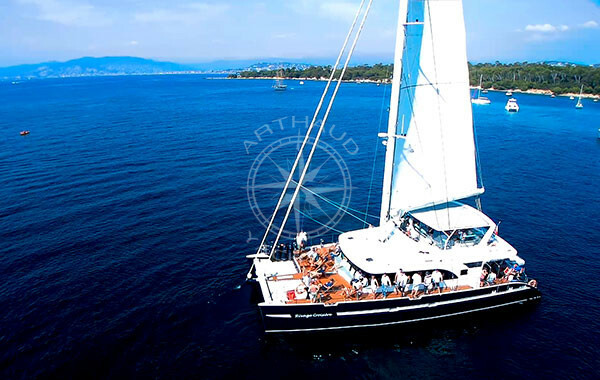 For what occasion should I use the rental of a catamaran in Antibes? 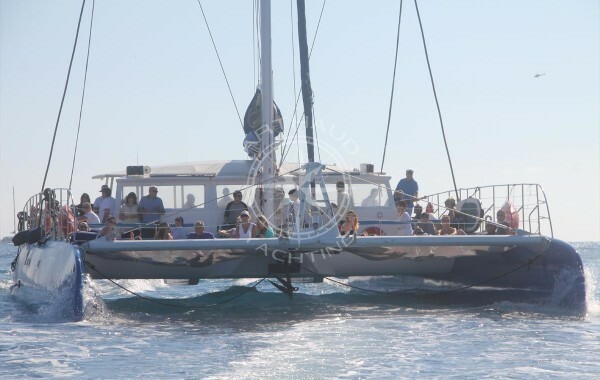 The rental of a catamaran boat around Nice and Golfe-Juan can be organised for numerous occasions: sports activities during a team building, relaxation and discovery of the region for an incentive, product launch day, family excursions, etc. The booking of a boat from the Vauban port of Antibes can be made by individuals or companies. It goes without saying that all the equipment necessary for navigation is on-board. Friendly and spacious, our catamarans in Antibes guarantee a festive atmosphere! What could be more romantic than organising romantic excursions with your partner around the island of Sainte-Marguerite in the bay of Cannes or near the Cap d’Antibes ? To celebrate a birthday or simply to share an exceptional moment, a rental catamaran cruise is an excellent solution to let go and find yourself together. However, a sea trip to Antibes aboard a catamaran can also be organised with friends to celebrate your latest promotion or a birthday. Many companies may also wish to rent a catamaran or a yacht for a special occasion during their events. The organisation of a meeting, training or seminar near Juan-les-Pins can be an ideal opportunity to plan the rental of a boat in the city of Antibes in order to reward team work. 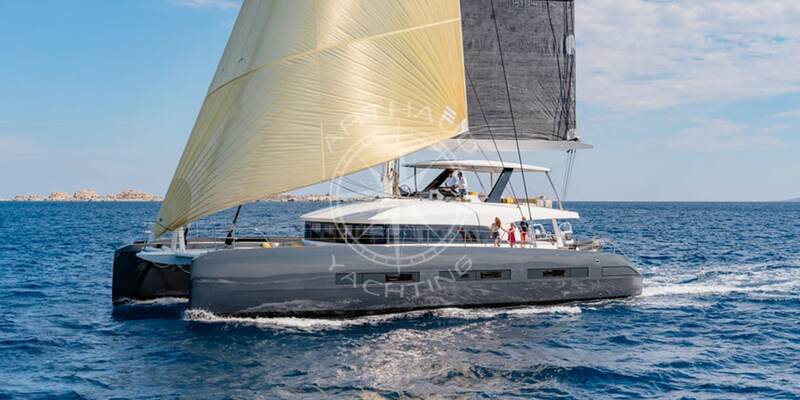 Our catamarans in Antibes and even our yachts can also be an excellent way to mark a product launch or a recent partnership with a major company. Renting a catamaran in Antibes: what are the benefits? Whether it is a special event or a corporate event, the use of a catamaran or yacht rental for a cruise in Antibes has many advantages. 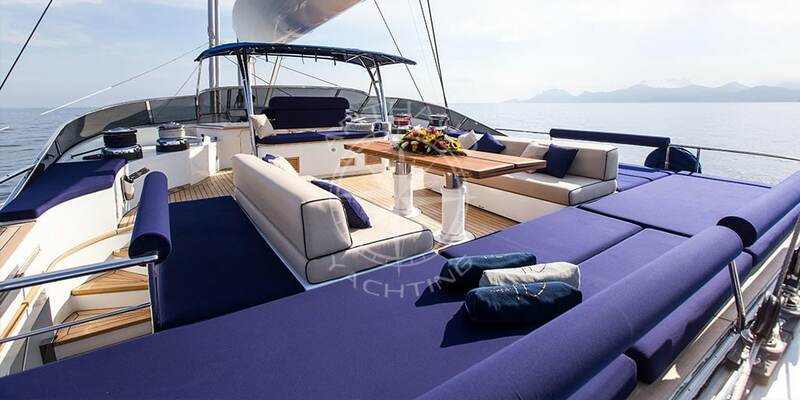 When you use Arthaud Yachting for catamaran rentals you can personalise the service provided to meet your expectations. Many drinks can be taken on-board, as well as food you have ordered. As for your favourite music, it can be programmed on the boat, and the entertainment you want to plan is organised by our rental agency. We will provide you with a multitude of additional services according to your specifications. Why not take advantage of a romantic stopover on Sainte Island by falling for the rental of a catamaran in Antibes or Juan-les-Pins, to make your wedding proposal? What could be more romantic than a trip by boat or yacht, for a day or a weekend, to meet your partner and share a special moment. Imagine yourself taking a sea bath in the turquoise water of the Cap d’Antibes…. 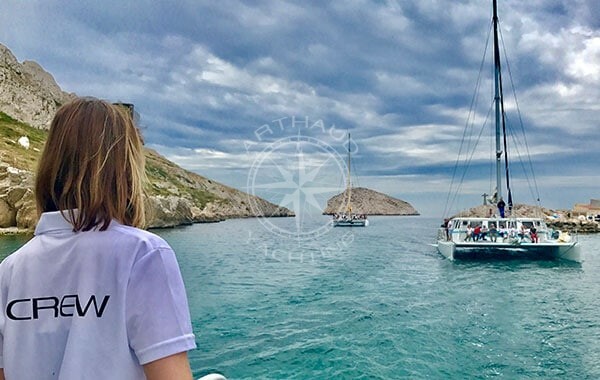 If it is a corporate weekend, food can be provided by Arthaud Yachting to satisfy all tastes during the excursion. You can ask for cocktails with and without alcohol to cater for all tastes, when sailing between Saint-Jean-Cap-Ferrat and Mandelieu. What should I know about renting a catamaran in Antibes? Renting a catamaran boat in Antibes is very simple. All you have to do is book the boat well in advance to make sure we can find you a boat available. The only requirements will therefore be to know how many people will be on-board the boat and how much food and drink will be required. In order to change from the traditional water skiing trip along the French Riviera, the rental of a catamaran is therefore an obvious one. As of today, you can plan your next weekend adventure for your friends or your company. If you have any doubts, the Antibes catamaran rental agency can advise you on the terms of your reservation as well as on the possibilities of visits during your stay at sea. We have in our catalogue several boats of all sizes and at all prices to make your choice. Once your boat is ready to leave for this day, all you have to do is explore the magnificent landscapes of the French Riviera and marvel at the beauty of the Alps and its untamed nature, facing the sea as far as the eye can see. You will be able to create wonderful memories with your loved ones and share excellent moments under exceptional weather conditions at a very reasonable price. To judge for yourself just read the testimonials of our previous customers. All that remains for you to do now is to decide to organise this dream weekend on the French Riviera and to live this unique moment to the full with people you love. If you have any further questions, please do not hesitate to contact us.